The Christmas Farm Inn & Spa is part of The Valley Originals, a group of locally owned and operated restaurants in the Mount Washington Valley. We display the group’s yellow flag with a fork and a plate. When you see the flag at a business, you know the owners want to nurture and promote independent restaurants. We believe that good food is essential to a healthy mind, body, and soul. That’s why we offer a menu of freshly prepared, authentic cuisine incorporating natural and organic ingredients, meats and produce that naturally looks great and tastes great. We source available products locally and regionally and work with quality purveyors to ensure farm-to-table quality and freshness throughout the year. Vegetarian and gluten-free options are available, and we can cater to most dietary requests. See our daily specials and enjoy the taste of real food made from scratch and cooked fresh. We do not add MSG or artificial flavor enhancers in our food. 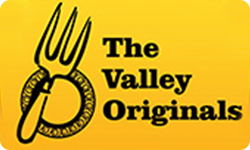 Another good thing about the Valley Originals is that it supports local organizations, charities and activities, so dining with a Valley Originals member restaurant not only means great food and service, but also support for good causes here in the area. All members are involved in the community effort. The Valley Originals gave $172,000 back to non-profit organizations in 2012 alone.